Dr. Jun Zhuang has been a faculty (Associate Professor, 2014 - present; Assistant Professor, 2008 - 2014) of Industrial and Systems Engineering at the University at Buffalo, the State University of New York (UB, or SUNY-Buffalo), since he obtained his Ph.D. in Industrial Engineering in 2008 from the University of Wisconsin-Madison. Zhuang received his M.S. in agricultural economics from the University of Kentucky in 2004, and a bachelor's degree in industrial engineering from Southeast University, China in 2002. Zhuang's long-term research goal is to integrate operations research, game theory and decision analysis to improve mitigation, preparedness, response and recovery for natural and man-made disasters. Other areas of interest include health care, sports, transportation, supply chain management and sustainability. 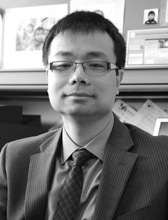 Zhuang's research has been supported by the U.S. National Science Foundation (NSF), the U.S. Department of Homeland Security (DHS) through the National Center for Risk and Economic Analysis of Terrorism Events (CREATE), START, the U.S. Department of Energy (DOE) through the Oak Ridge National Laboratory (ORNL) and the U.S. Air Force Office of Scientific Research (AFOSR) through the Air Force Research Laboratory (AFRL). Zhuang is a recipient of the UB's Exceptional Scholar—Young Investigator Award for 2013. He is also a fellow of the 2011 U.S. Air Force Summer Faculty Fellowship Program (AF SFFP), sponsored by the AFOSR, and a fellow of the 2009 - 2010 Next Generation of Hazards and Disasters Researchers Program, sponsored by the NSF. Zhuang has published more than 30 peer-reviewed journal articles in Operations Research, European Journal of Operational Research, Annals of Operations Research, Journal of the Operational Research Society, Military Operations Research, Risk Analysis and Decision Analysis, among others. His research and educational activities have been highlighted in The Wall Street Journal, Industrial Engineer, Stanford GSB News, The Council on Undergraduate Research Quarterly and The Pre-Engineering Times, among others.